On the eve of his fifteenth birthday, Nick Banner is thrust into a world where supernatural forces are fighting an ancient war. 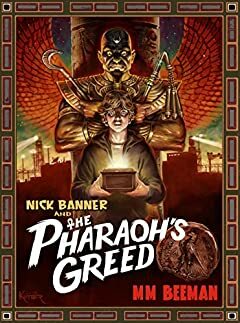 As if school and shuffling through foster homes werenâ€™t enough, young Banner becomes the target of an evil corporation that thinks Nick is the key to unearthing a powerful artifact from the time of Moses.Nick Banner thinks heâ€™s just a below-average foster kid. His father went missing when he was sixâ€”no one really knows what happened. Jaded by his past, Nick has grown up feeling worthless, but one soul has been tethered to him since he was a child. His father's friend, Gabe Reed, became a mentor to Nick in one of those big brother-type programs. If it werenâ€™t for Gabe, Nick would feel more lost than he already was.Relying on Gabe for help, they uncover a dark mystery regarding Nickâ€™s father. Not wanting trouble, Nick resists, but when secrets of his past are revealed, he canâ€™t stop digging for the truth.